Just like any other day, I stepped into the train without thinking much. Then I realised it was more packed than usual, and some kids stepped out as I was stepping in. It was during rush hour so was a little surprised that they were there in a group. When I was snugly in the carriage, those same 5-6 kids came back into the train, just in time as the doors were closing. I then realised they had come out to make way for those from my station. I thought, how very nice and thoughtful of them! That thought lingered in my head for a bit as the train moved to the next station. I was still a little stunned because I had never met such well-mannered children before. They were probably in middle high school, most likely preteens. I was not sure if they were on a school trip because they were not wearing school uniforms. But one thing's for sure, there were a few who were like "ketua darjah" in the group, because they would remind the rest to be quiet, or not to move around too much. At some points when the train was moving upwards, some would lose their balance, causing a domino effect. Because it was too packed, I couldn't even reach for the hang rail, so bumped into the grrl next to me. From then on, she became a little more conscious of me. I think I heard her telling the boy on the other side next to me, to be mindful of the people around them. 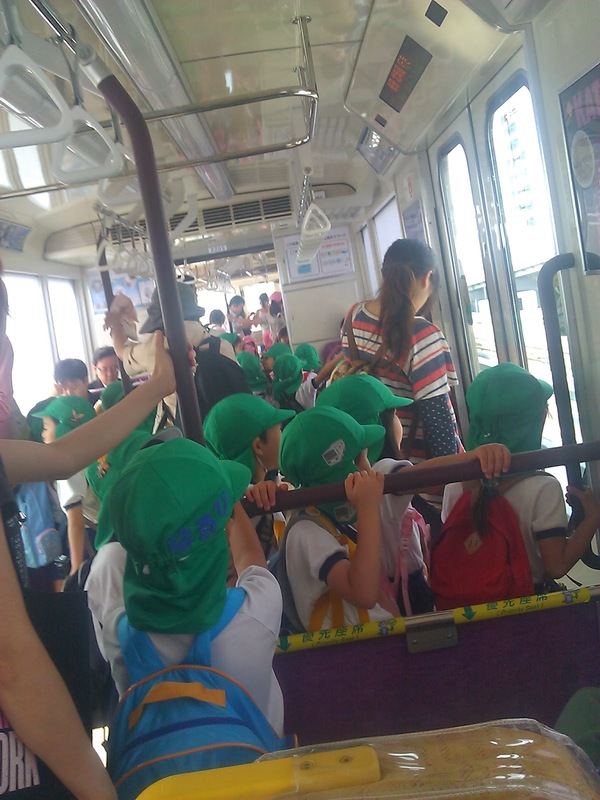 A few months ago, when I was taking the later train to work, there were some younger kids who seemed to be on an excursion being accompanied by their teachers. It made sense because it was a non-peak hour, and the children were still very young. And yet, they were standing just like any other train passenger. If you notice in this picture, there are some yellow seats nearer to the door. These are designated "priority seats", meant for the elderly, pregnant ladies, and those who are physically challenged. Even then, the kids did not occupy those seats. Japanese kids are trained from a young age to be respectful, be conscious of the people around them, and to not "disturb" other people as much as possible. Because of this, they grow up to be patient and considerate. I've even seen 3 young children on a train by themselves. Must have been siblings; an older sister not older than 10, and older brother also around the same age, and their youngest, a boy probably around 5. Even before they had arrived at their destination, they stood up and waited at the door. Without holding to anything, they patiently stood there until they reached their station while trying to maintain their balance. No wonder Japanese men can even sleep while standing!